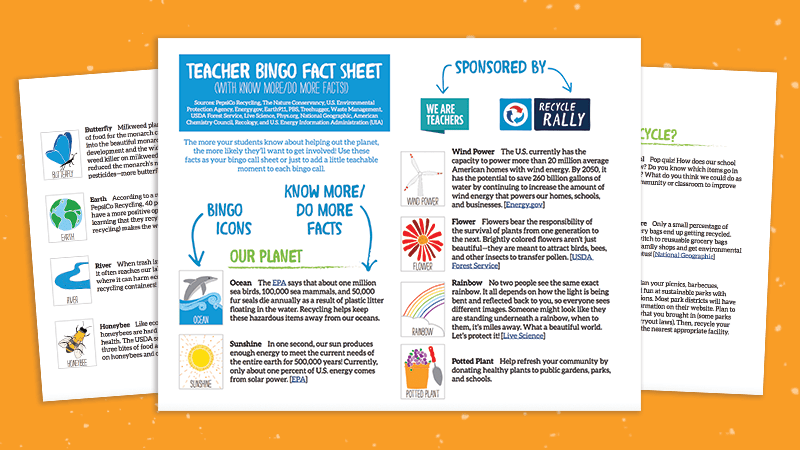 Download our recycle-rallying, planet-loving bingo game for your classroom and inspire activism! Everybody loves a fun game of bingo—especially students! Get them engaged and active in their school and community with this inspiring recycle bingo game. They’ll have a blast, all while learning fun facts about the what, where and how of recycling, plus, why they should get involved, and take action! Hand out bingo cards to student players. There are 30 unique versions in our printables. Pick a small object to mark your squares. We love the idea of clean, washed recyclable bottle caps! You or a student can be the Bingo MC and call out from the list of planet-themed icons on the prompt sheet. Check them off as you go. Or, cut out the planet pics from a few boards, and pull from a hat to make the bingo calls. 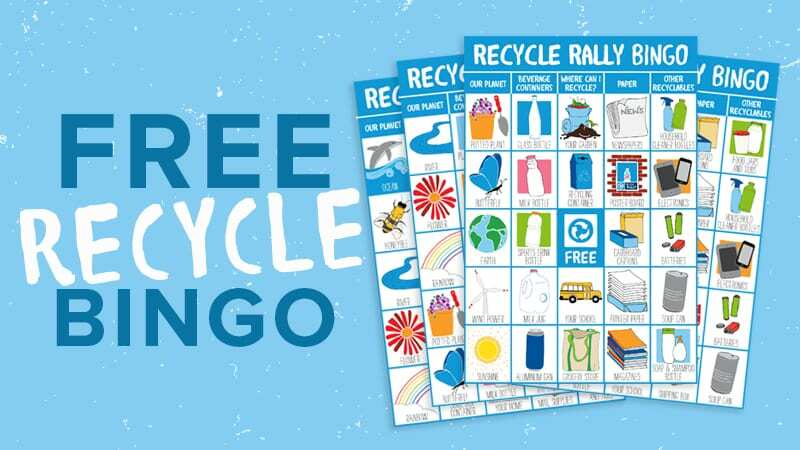 Once a student has 5 squares covered in a row (horizontally, vertically or diagonally), they call out “Recyle Rally!” or, more traditionally, “BINGO!” to win the round. We’ve included a printable “teachable moment” prompt sheet with our bingo printable! How does recycling our papers, plastics, and metals help the planet? Why do recyclables like soup cans and electronics matter? What’s a fun fact about how recycling efforts help our oceans? With each bingo call, there’s a fun, smart fact to teach and share! 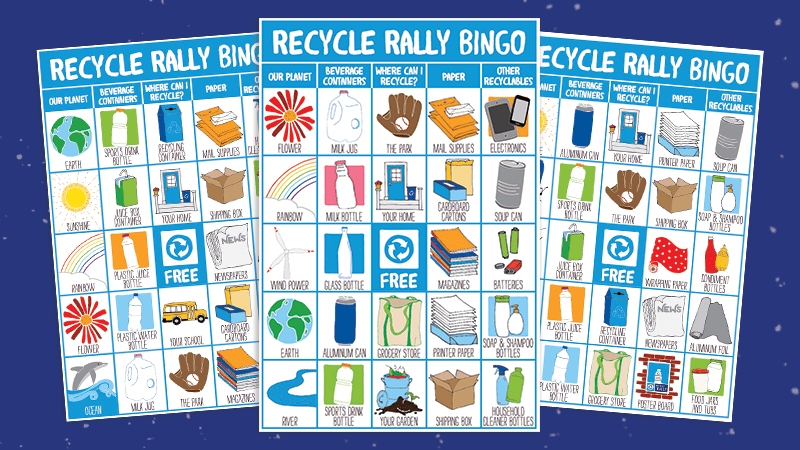 30 printable Recycle Rally Bingo cards to play and inspire recycling and earth activism! A cut-out sheet to help guide your game bingo calls (or play the “cut and call” version and draw pieces from a hat). One “teachable moment” prompt sheet with bingo card images that include fun facts on recycling and the benefits of greening our planet. Please check locally what is recyclable—not all of these items might be in your area. Yes! Please send me the WeAreTeachers e-newsletter packed with great teaching ideas and giveaways. Yes! Please send me news and offers from PepsiCo Recycle Rally.